Addressing the growing demand for readily available solutions that implement Differential Power Analysis (DPA) countermeasures, Rambus Cryptography Research developed a family of semiconductor IP cryptographic cores and software libraries that are designed to protect against side-channel attack vulnerabilities. 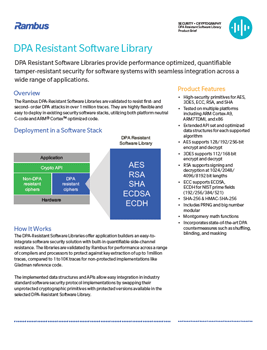 Learn more about our DPA Resistant Software Libraries, and its flexible integration with standard cipher modes such as Cipher Block Chaining (CBC), Electronic Code Book (ECB), etc. in this brief.